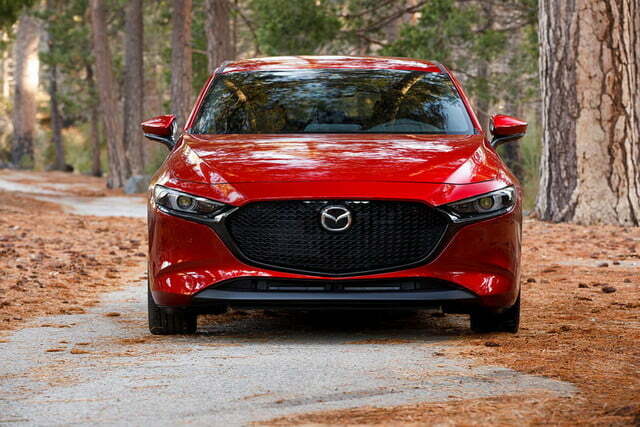 The 2019 Mazda3 punches above its weight and performance and features. Mazda has offered an affordable compact car since the 1970s. It’s gone by a lot of names over the years, but it’s been called the Mazda3 since 2003. The all-new Mazda3 that just went on sale all over America is the fourth generation to bear that name, and by all measures it’s the best Mazda3 ever. 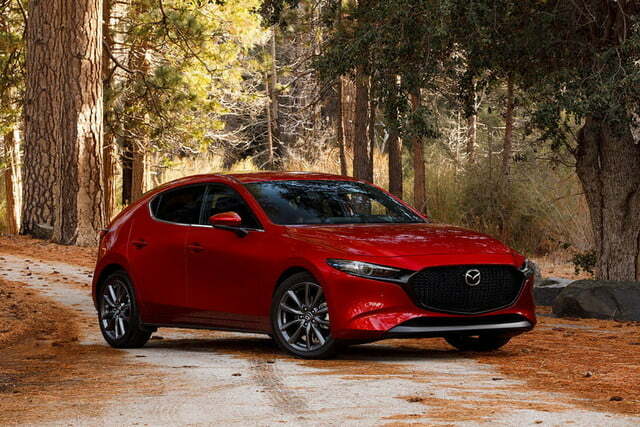 Mazda has remained true to the formula of a peppy compact model available as a sedan and as a hatchback, but it has also added some very attractive modern features. It’s all part of the company’s “Mazda Premium” plan to move upmarket. 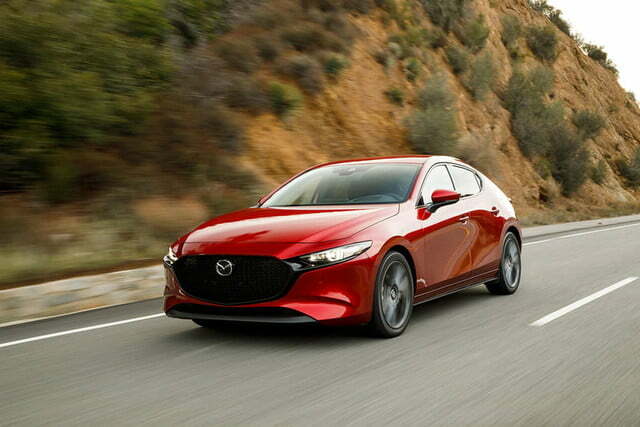 The 2019 Mazda3 will be the acid test for this plan. The trim walk for the new Mazda3 is admirably simple. For the sedan, there’s a base model, then Select, Preferred, and Premium trims. The base trim with front-wheel drive starts at $21,895 and rises to $28,795 for the top Premium trim with all-wheel drive. The Hatchback costs a bit more, starting at $24,495 for the base trim with front-wheel drive and ranging up to $29,795 for Premium trim with all-wheel drive. 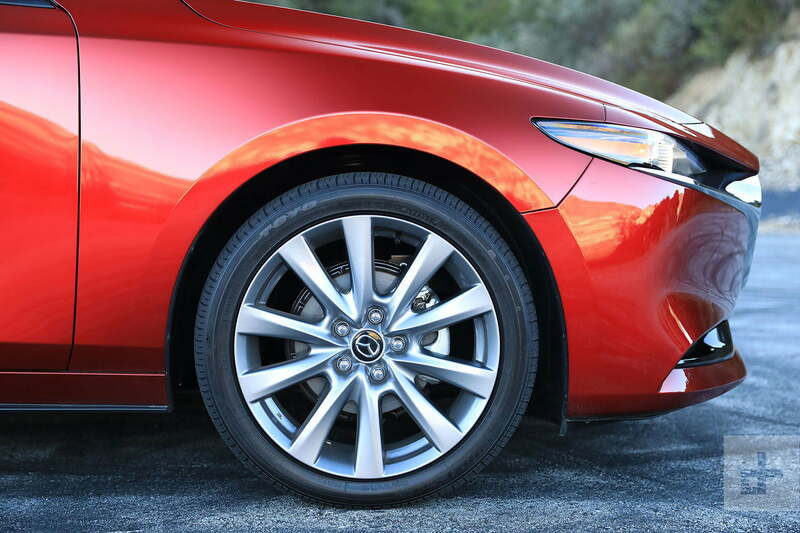 One of the high points of Mazda’s trim walk is that you can get all-wheel drive in almost any trim. 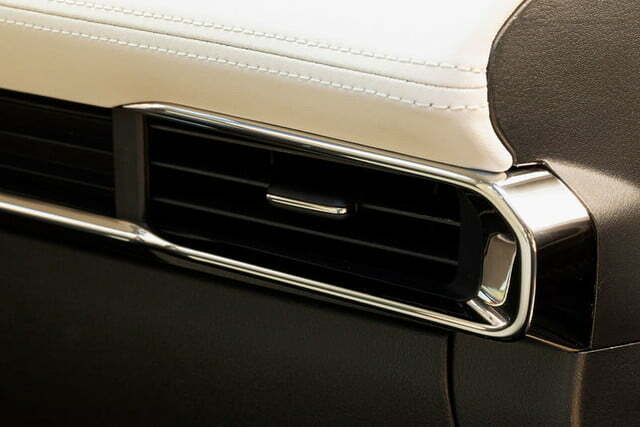 However, the star of the show is the Premium trim because of the great features packed into it. Mazda is asking for a few thousand more than the economy competition for the Mazda3 Premium, but not as much as the luxury brands. What remains to be seen is if consumers will embrace the Mazda3 for its premium features, or retreat to the homely charms of a Toyota Corolla or the Honda Civic. Describing an economy car is usually futile because they’re either bland as paste or they’ve been beaten with the ugly stick. 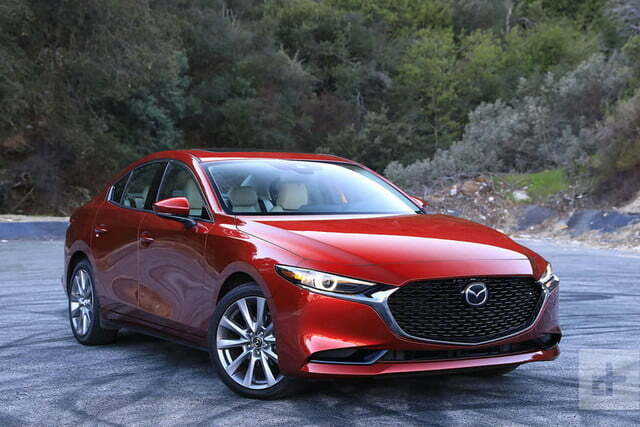 It’s a pleasure to say the 2019 Mazda3 sedan is the best-looking economy compact on the market. 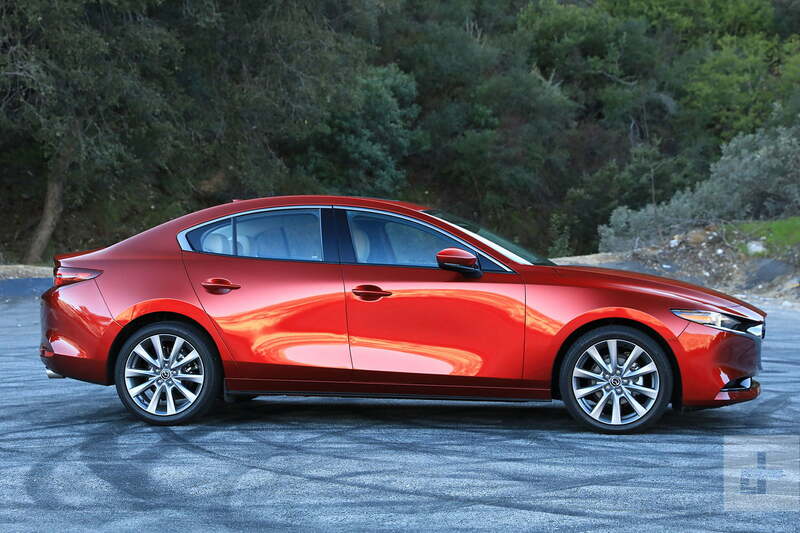 As usual, Mazda’s craftsmen got the lines and proportions just right. The front end is bold without being heavy, and the entire car suggests speed and agility. What’s more, the Mazda3 sedan still wins the beauty contest against premium competitors like the Acura ILX or the Lexus IS. It’s a really good-looking car. The Mazda3 hatchback is more controversial and personal. To our eyes, the Mazda hatch has the look of a classic European sport coupe such as the Alfa Romeo Giulietta Sprint Zagato or a Lancia Aurelia. Less discriminating viewers might say it looks like an AMC Pacer. The one thing everyone can agree on is that you will either love or hate the hatchback, and Mazda deserves praise for green-lighting something that is not a bland compromise in any way. Both cars ride the same platform with minor changes, and carry the same suspension and driveline designs, although the only sheet metal parts truly used in common are the rocker sills and the hood. Mazda’s near-legendary clay modeling process will have you washing a new Mazda3 daily just to admire the reflections in the smooth curves of the metal. 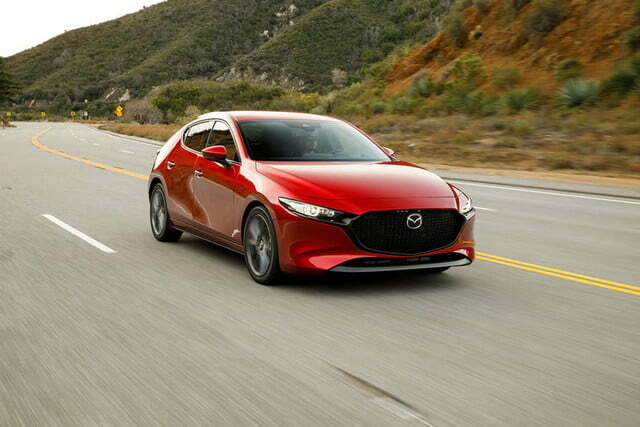 The 2019 Mazda3 is the acid test for Mazda’s plan to move upmarket. 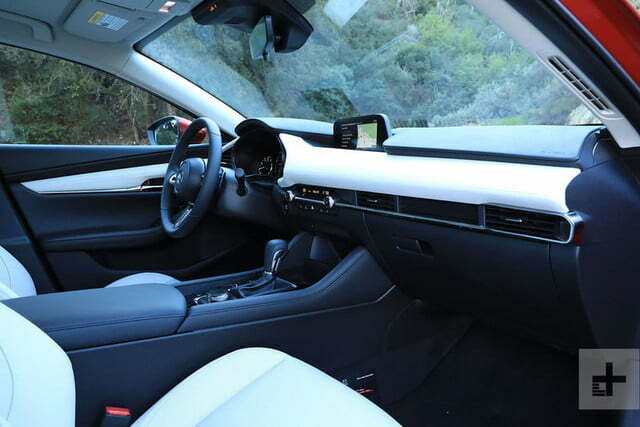 Inside the Mazda3 is where the Mazda Premium program is most obvious. At the top trim levels, you’ll find an interior that’s worthy of a premium brand, with stitched leather, heated seats, and soft-touch surfaces. 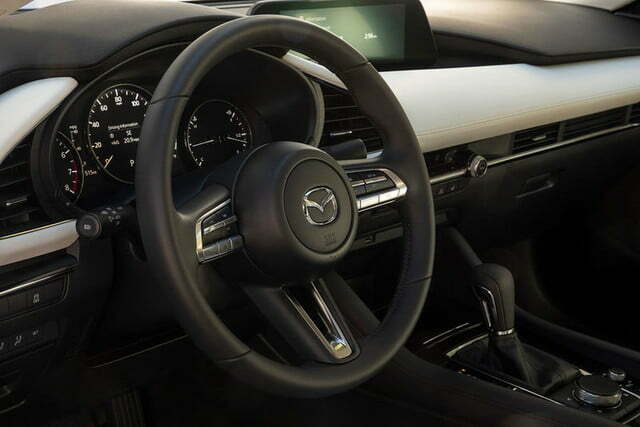 Mazda’s engineers paid attention to details like making sure that all the buttons have the same pressure feel, which is a direct lesson from the top coachbuilding marques. Small touches like that go a long way to delivering an abstract “better” impression of any vehicle. Mazda’s fit and finish are also worthy of a premium brand. Seams and join lines meet up nicely, with tight and even gaps. Here again, small things like the brushed aluminum covers over the optional Bose audio system speakers in the doors lend an upscale feel to the Mazda3. The impression continues with the innovative center console armrest, which slides back out of the way rather than lifting up where your arm wants to be. When it comes to cargo, the sedan offers 13.2 cubic feet of trunk space, and the hatchback offers 20.1 cubic feet. More importantly, either style of the Mazda3 offers plenty of headroom and space for taller drivers. In our day long test drive, two relatively big and tall guys shared the front row without feeling cramped. To add context, the sedan and hatchback variants of the Honda Civic boast 15 and 25.7 cubic feet of trunk space, respectively. Tech is a big part of Mazda’s push to premium. In the new Mazda3, it takes the form of an updated user interface for the infotainment system, the usual assortment of driver assistance and safety features, and a few really smart changes that other premium brands haven’t done yet. On the safety side, the base trim sedan comes with the same standard equipment as any other car, but the base hatchback and Select sedan models come with adaptive cruise control, blind spot monitoring, smart city braking with pedestrian detection, automatic high beams, lane-keeping assistance, and driver attention alert. That last feature deserves an explanation; driver attention alert uses a camera pointed at the driver and a system monitoring the car’s track on the road to detect fatigue or inattention. If the driver shows signs of fading, the system sounds a warning and reminds the driver to stop and take a break. The standard sound system uses eight speakers, which is pretty generous. However, the Bose premium audio system comes in at the mid-grade Preferred trim, so many if not most Mazda3 buyers will enjoy the 12-speaker system. Mazda did something great with both sound systems; it moved the big bass driver speakers out of the doors and forward into the driver and passenger footwells. Mazda’s engineers assured us that this improves sound quality, but it also stands to reason that putting the speakers down there eliminates a big hole in the door, and you won’t be bashing the speaker around every time you shut the door, so it also eliminates creaks and buzzes that develop over time. The Bose stereo sounds great, by the way. You should definitely get it. Describing an economy car is usually futile because they’re either bland as paste or they’ve been beaten with the ugly stick. The infotainment system has been made more intuitive and easier to use. Both Android Auto and Apple CarPlay are supported, which means you can save a few bucks on the on-board GPS navigation system if you want to. The infotainment screen has been enlarged to a wide-format, 8.8-inch display, but what’s new is that Mazda placed it up on the dash and completely out of reach. That’s OK, because it’s not a touchscreen. 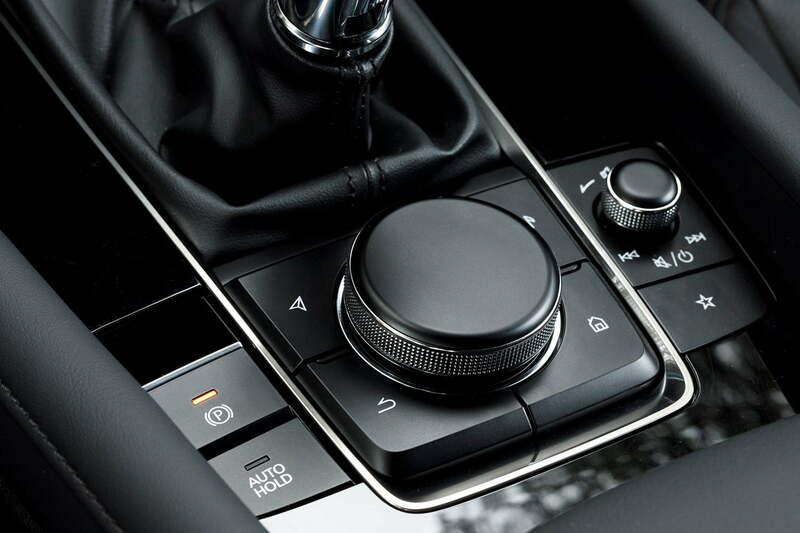 Mazda’s safety engineers determined that drivers have to shift around in their seat and reach too far to use any touchscreen, so the 3’s system is controlled entirely through a dial-joystick and a button interface mounted down on the console. The armrest is designed to support your forearm and wrist so you can use the system without moving your body out of the driver’s seat. It works pretty well; it’s certainly better than any of the touchpad-based system we’ve tested. We think if you give it a week you’ll be working it like a boss. One final thing to mention about safety and driver assistance is the head-up display, which is included in the top Premium trim. Formerly, the Mazda3 had a little plastic lens on the dash and the head-up information was displayed there. However, that required the driver to glance down and refocus his or her eyes to the dash. The new Mazda3 now projects the HUD onto the windshield, but focuses it so you perceive the display as being out over the hood of the car. This means that you don’t have to move your eyes off the road or refocus your vision to take in the HUD, and that’s really nice, especially put together with the high-mounted infotainment screen. First and foremost, Mazda is a driver’s brand. Do you remember the zoom-zoom ads? It has built its reputation on that, and it’s on that reputation that it’s reaching for premium status. The new Mazda3 does not disappoint on the road. The first driving we did was to test a variety of cars on the snow up in the mountains. We drove a short test course that included a challenge to get going on a hill, make a quick acceleration and turn, and manage a downhill stop. Even the front-wheel drive Mazda3 on normal, all-season tires did a creditable job. When you add the i-ACTIV all-wheel drive system, the Mazda3 on all-season tires is quite capable. If you add a good set of winter tires, you can laugh at any icy weather. Another feature we tested on the snow course was Mazda’s industry-unique G Vectoring Control system, now upgraded to GVC+. The basics of this system are that the Mazda3 (and most other Mazda products) very slightly reduce engine torque output when you tip in steering to enter a curve or take a corner. This causes vehicle weight to shift forward onto the front wheels, helping them grip. GVC+ will also apply a slight brake drag on the outside front wheel as you unwind steering to straighten out again. You won’t ever notice this effect working, you’ll just experience the system as surprisingly crisp and responsive steering. 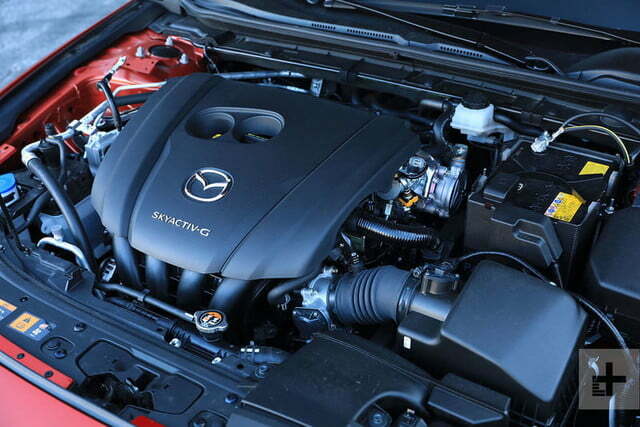 For the moment, there’s just one engine driving both Mazda3 models. It’s a 2.5-liter, direct-injected four-cylinder good for 186 horsepower and 186 pound-feet of torque. The engine is bolted to a six-speed manual or a six-speed automatic transmission. 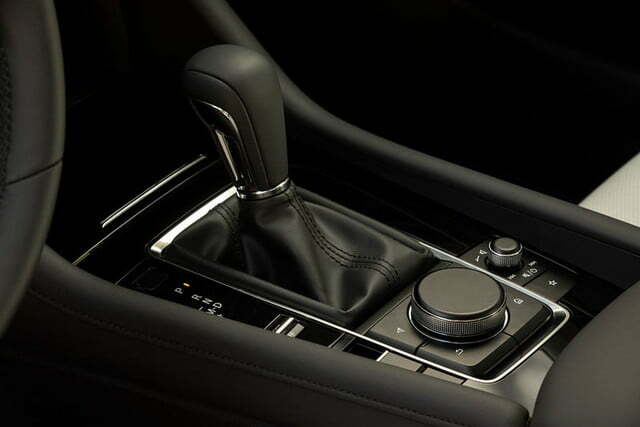 The automatic may be front-wheel or all-wheel-drive, but the manual is always front-wheel drive. We spent a day in California’s Sierra Nevada mountain range carving canyons and unwinding the ribbon highway. Coming back to dry pavement, the Mazda3 is a delight to drive. We spent a day in California’s Sierra Nevada mountain range carving canyons and unwinding the ribbon highway. Mazda abandoned the multi-link rear suspension for a more primitive torsion beam rear in this generation, but it works as well as more complicated systems. The universal finding is that it’s easy to go fast in the Mazda3, and we were relying on the adaptive cruise control to keep off the radar (literally) of the California Highway Patrol. The Mazda3 is just OK on fuel. Equipped with all-wheel drive, the hatchback returns 24 mpg in the city and 32 mpg on the highway. The sedan betters that by a single mpg, yielding 25 city and 33 highway. If you select the front-wheel drive and automatic, you can get the Mazda3 up to 27 mpg city and 36 mpg highway, but let’s be honest: no one’s cross-shopping this car against a Prius. Choosing rivals to the Mazda3 is an interesting challenge. On the one hand, the Mazda3 has always competed with the economy car heavy hitters: Honda Civic, Toyota Corolla, and Nissan Sentra. 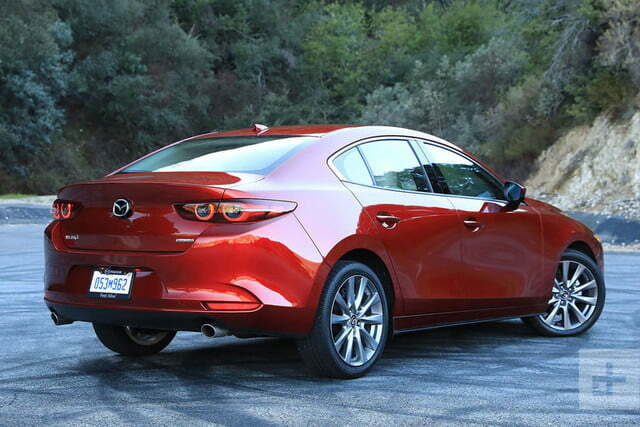 But the top trims of those all price out at about the same as the mid-level Mazda3 Preferred trim package now. They’re comparably featured at that point, so the Mazda can still compete as an economy car. But it’s more apt to say the real competitive set of the Mazda3 now is the Acura ILX, Lexus IS, and the Audi A3. 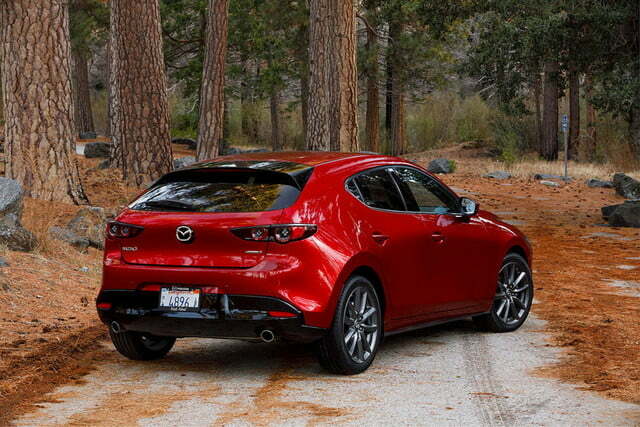 Among those, the Mazda3 top trims compete directly on features and performance, and the only one that can compete with the Mazda on price is the Acura. When you feature up the Acura, it costs $30,790 to the Mazda’s $29,415, and the Acura doesn’t offer all-wheel drive. The Audi and the Lexus are both priced substantially higher than the Mazda. All that kind of leaves the Mazda3 in a class by itself. Which is really not a bad place to be, if consumers agree that the product is now worth more than its former economy class competitors. The 2019 Mazda3 comes with a three-year or 36,000-mile basic warranty, and a five-year or 60,000-mile powertrain warranty. There’s also a roadside assistance program during the warranty periods that provides towing to a Mazda dealer if a warranted part leaves you stranded. Configuring the 2019 Mazda3 is easy. We want the goodies and we want the all-wheel drive so it’s Premium trim for sure. Body styles are a close choice, but we’d take the hatchback and let the haters burn. 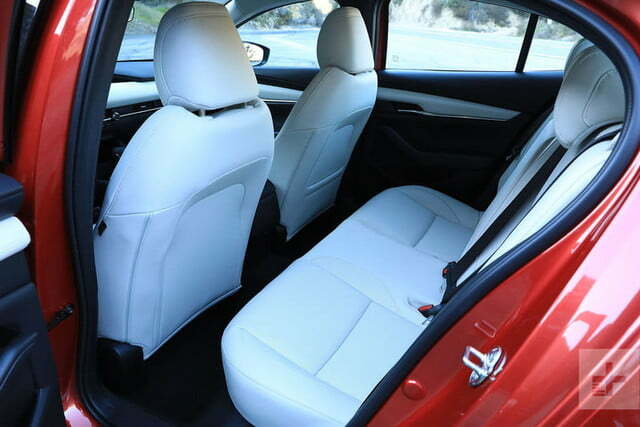 We love the soul red crystal for paint, and the red leather interior available with the hatchback is compelling. Yes, we’d be spending $30,000 on a compact car, but it’d be well worth it. Mazda has done a great job with the 2019 Mazda3 hatchback and sedan. It’s proud of it, and so it’s asking for some extra money. If you cross-shop and test-drive the economy brands, you’ll find the Mazda a solid step up. If you cross-shop the premium brands, then the Mazda is a great bargain on comparable features and performance, but you won’t get the expensive badge. It’s going to come down to whether you believe in Mazda Premium.